Stage of Forest，located at Songhua Lake Resort in Ji Lin，is situated on a hillside between the forest and the slope. The site is surrounded by luscious greenery in summer and covered by an overwhelming white snow in winter. As is a delicate site for a ‘Land(scape) Mark’, one whose indefinite programming demands a careful degree of deliberation. The location and triangle shape of the stage was only determined after precise examination and deduction of the site condition, to minimize the impact for the existing vegetation and to maximize the view on the platform. While sitting on the hill, it is facing the Songhua lake at a distance, who is famous for the rime in its surrounding areas. As one descends from the mountain top, the ‘Stage’ rises slowly above the undulating landscape, in a way like a piece of leaf floating on the water. Positioned with the 2 side-line along the approaching eyesight of the visitors from two routes: the trail in the woods and the ski-slope. 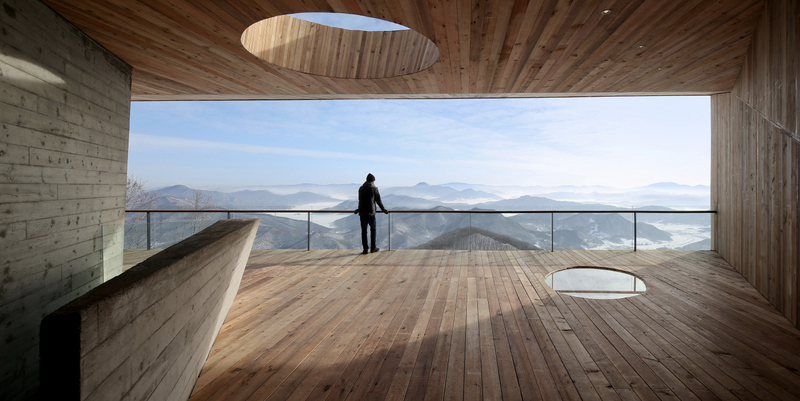 Not only it doesn’t obstruct the view to the lake and mountains, it even enhances the experience by inducing ever-changing tension between the cantilever and the surrounding landscape. The entire “stage” is like growing out from the mongolian oak forest, and cantilevering on top of the ski-slope. Because the orientation of the distant view(horizontal unfolding lake), and the close view(vertical extending slope) is at a different angle, the building results in a twisted gesture between the wood stage and the concrete base. The building combined rough materiality with its sensuous form. Seen from afar, the stage is a dark, free-floating monolith in the landscape, with a heavy concrete “base”. Come closer, the reflection on the charred cedar shingles(Shou-Sugi-Ban) becomes faintly perceptible - even turns silvery with the changing angle of sunlight. After one meandering through the forest boardwalk and finally arriving in front of it, the chapped surface of the shingles and the wood texture of the cast concrete become tangible. The interior is choreographed through a carefully plotted experience. Upon entering the concrete vestibule, in the moment your eye adjusts to the dimmed light, a vertical view along the stretching slope will catch you first, then a narrow staircase hints the only way of elevating. When you arrive at the platform level and turn around, what suddenly opens up to you is a great panoramic view of the Songhua lake, winding in-between the hills, clear or hazed by with the ever-changing mist, an exceptional vista that is breathtakingly beautiful and magical. A pair of ovals openings cut through the volume, one on the roof leading sunlight and snowflake into the space, the other one on the floor intriguing interaction between people above and under the stage. The red cedar wall has been left untreated and is vivid in color shades, in contrast to the building’s dark Shou-Sugi-Ban exterior. META-Project believes, designing in nature is to introduce an enlightening medium between nature and people. The “Stage of Forest” is not just a look-out, it is a flexible public space that can hold events, exhibitions, meetings and workshops... The building is intended to stimulate people to come up with more ideas of exploring their relationship with the nature, and itself also becomes part of the nature.